It’s been a long time since I’ve done a Design Wall Monday post. So, this is what my wall looks like at the moment. On the wall is the Hourglass quilt which needs one more border of the green then I can quilt it. Peeking out from behind it is my first block of Now and Later. It was my leader ender project as I was working on the Hourglass quilt. I was stitching 2-1/2″ light squares to 2-1/2″ x 4-1/2″ rectangles. That worked well. Sewing the blocks units together as a leader ender, not so well. On the back of the chair is the backing from En Provence. It’s still needs to be bound, but first I need to trim the quilt. On the shelf on the right is the black and white Strip Twist which still needs threads trimmed and a label. I found out over the weekend I do not have to put a sleeve on the quilt to hang it in the guilt show. 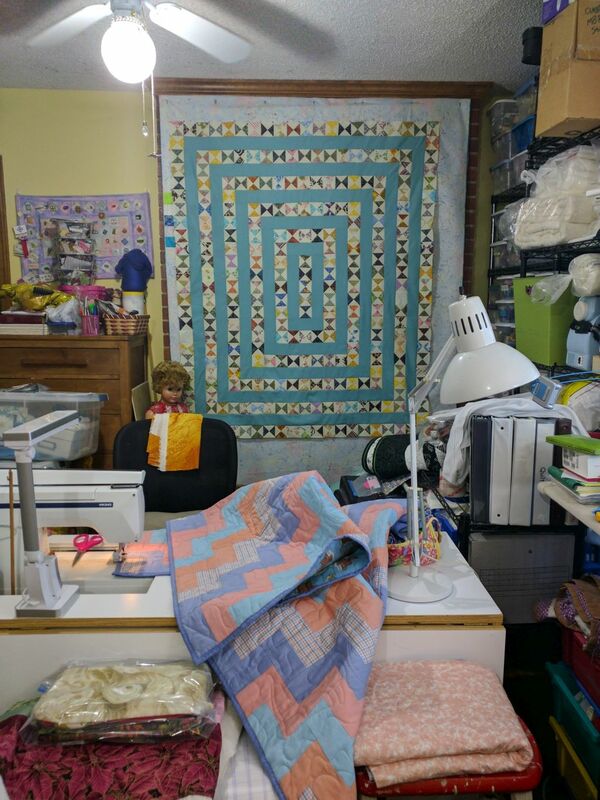 Literally under my needle is the larger of the two pastel rail quilts. I sewed the binding to the back and I’m doing a decorative stitch to stitch it down to the front. I’m maybe halfway through. In front of the table on the right is the other pastel rail quilt. I will use the same binding. I was able to cut the binding for both quilts from a single shirt — and I still have fabric left over. I used the back, 3/4 of one sleeve and the right front. On the left, is a bag of kits. There are several pillow cases and zipper bags in that bag. When I get everything bound, I’ll work on them. They are sitting on top of Christmas Crazy Eights. My goal is to have everything bound, labeled and washed by Saturday morning before I go quilt the hourglass quilt. I do not know if I’ll make it, but I’m going to give it my best.